The voltage needed to make the spark jump 20cm in open air, is somewhere close to 200.000 volts. An enormous potential difference that breaks the air resistance and only lasts for a few fractions of a second. To build a Marx generator is easy because of the repetitive, symmetric design. High voltage capacitors and high voltage resistors are the only “ingredients”. Time and patience are also required to complete this construction. More details on my setup are available here. 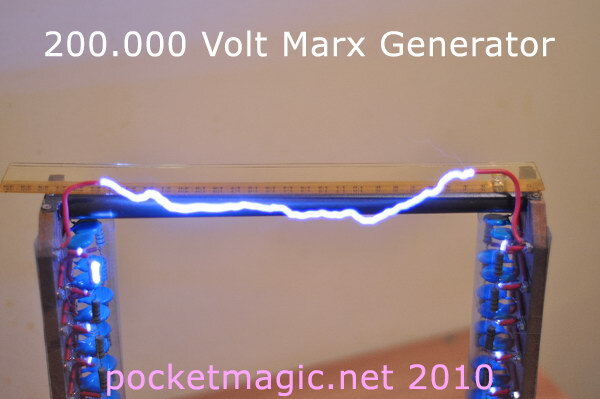 i would like to build a 200kv marx generator. kindly send me the details and source of the components.